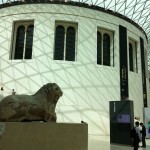 If you’ve ever been to the British Museum you’ll know that it’s huge and that you could easily spend several hours browsing the exhibits. Luckily, the nice people who work there have come up with a self-guided tour that will take you around the highlights of the permanent collection in just one hour. Given this is about as long as most children’s attention span, we thought we’d give the whistle stop tour a go. We started with the twelfth century Lewis Chessmen, which captivated my little boy, and then took in treasures from ancient Persia, Mesopotamia and Rome, before heading to the top of the Museum to see Japanese Samurai armour (definitely one for the kids). 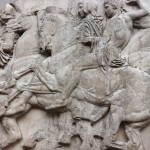 The tour then takes in a Ming jar decorated with flamboyant dragons, a sculpted head from Ife in Africa and a huge statue from Easter Island, finishing with arguably the Museum’s most famous objects, the Rosetta Stone, Assyrian Lion Hunt reliefs and Parthenon sculptures (Elgin marbles). By following the itinerary, you pass through pretty much all of the rooms in the Museum, and can stop to have a longer look at anything that catches your eye in addition to the advertised highlights. For MJ, the Wellcome Trust Gallery proved particularly fascinating with its vast Cradle to Grave work by Pharmacopoeia. It took us longer than the allotted hour to complete the tour, hampered in part by the pushchair in some of the busier rooms and queuing for the lifts, and mostly because we were side-lined for a while by the Museum’s famous Egyptian mummies (as compellingly gruesome as ever). Until 9 September 2012, the British Museum has a special display of the Olympic and Paralympic medals, alongside posters and objects from previous Olympic and Paralympic Games that were held in the UK. Having seen plenty of medals being awarded to Team GB on the television, we were pleased to get a close up of the real thing. Kew Garden’s North American Landscape garden on the Museum’s West Lawn (until 25 November 2012) is also well worth strolling, or toddling, around if you have time. A classic day out with all manner of exhibits to take your fancy and plenty of space, inside and out, for children to explore. 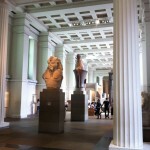 Admission to the British Museum is free. Some special exhibitions attract an admission fee. 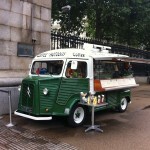 There’s a good choice of eateries at the British Museum. Head to the stunning, glass-roofed Great Court at the heart of the Museum for informal refreshments at the two Court Cafés – seating is available at sharing tables and there is plenty of space in the Great Court for toddlers to stretch their legs. High chairs are available. Open 9am to 5.30pm Saturday to Thursday, 9am to 8pm on Friday. Another good family option is the Gallery Café, which is located on the ground floor behind Room 12. This serves hot and cold food, including kids’ meals, hot and cold drinks and snacks. High chairs are available. Open 11am to 5pm daily. More formal dining is available at the Court Restaurant. If you don’t fancy any of the above options, there are also stalls selling refreshments in the Museum grounds outside the main entrance. Families can picnic in the Ford Centre for Young Visitors at weekends and in the school holidays. 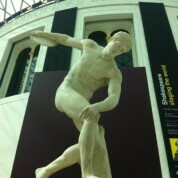 Children are well catered for at the British Museum. On arrival, make a beeline for the Families Desk in the Great Court to see what’s on. Activity backpacks, children’s activity trails and art materials are available, plus special events for children are laid on regularly (weekends and school holidays). The museum is accessible to pushchairs. There are baby changing facilities and a baby feeding room. High chairs are available in the cafés. 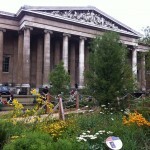 The British Museum galleries are open daily from 10am to 5.30pm (8.30pm on Fridays). By train: Tottenham Court Road (Northern and Central Lines), Holborn (Central and Piccadilly Lines), Russell Square (Piccadilly Line), Goodge Street (Northern Line).